Abel James Abbiehl: “Look! Santa!” Kennedy Eastwood: “Those aren’t reindeer!” Abbeihl, left, and Eastwood along with Kayla Mitsven, center, react as Santa Claus pulls up to the city square in a horse-drawn carriage for the 2017 Holiday on Central. The deer, Santa explained once he got to the microphone, were left behind at the airport after he landed. 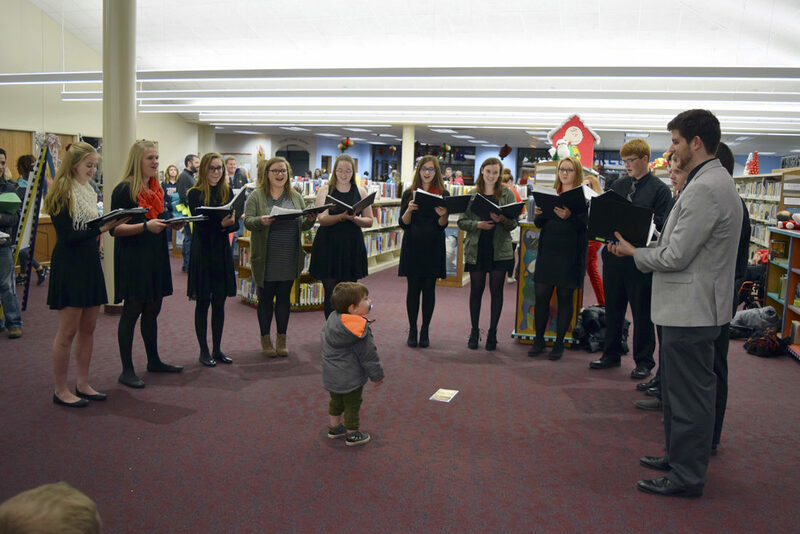 Luke Miller, 2, of Fort Dodge, moves in closer as the St. Edmond choir provides Christmas Carols at the 2017 Holiday on Central celebration. 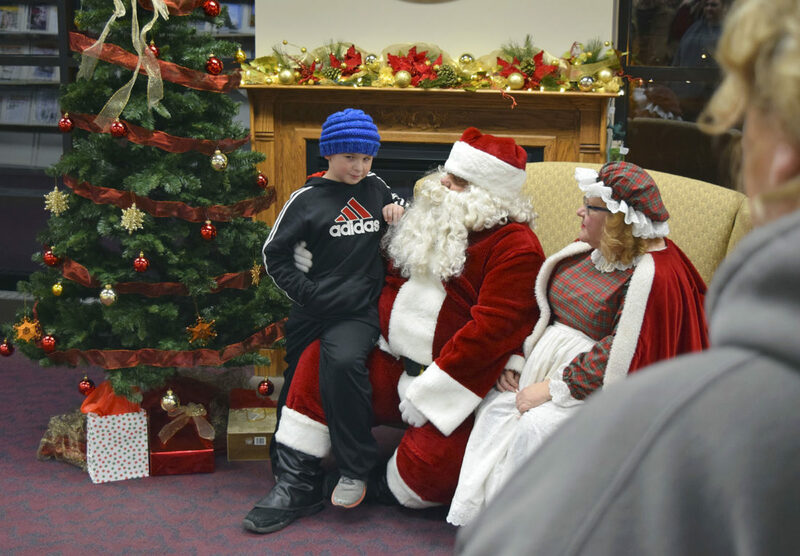 Tucker Gill, 7, thinks over whether he’s been good all year or not, as his mom Angie Gill looks on at right. Gill was eager to be near the front of a long line to see the Christmas couple at the Fort Dodge Public Library for the 2017 Holiday on Central. Linkynn Skoland, 5 months, is having a great time at her first Holiday on Central in 2017 with her grandma, while her older sisters visit with Santa and make crafts. Tommy McDonald helps his daughter Maryah McDonald, 6, get the feathers just where she wants them. Stickers and feathers and crayons were all available at the holiday craft station. 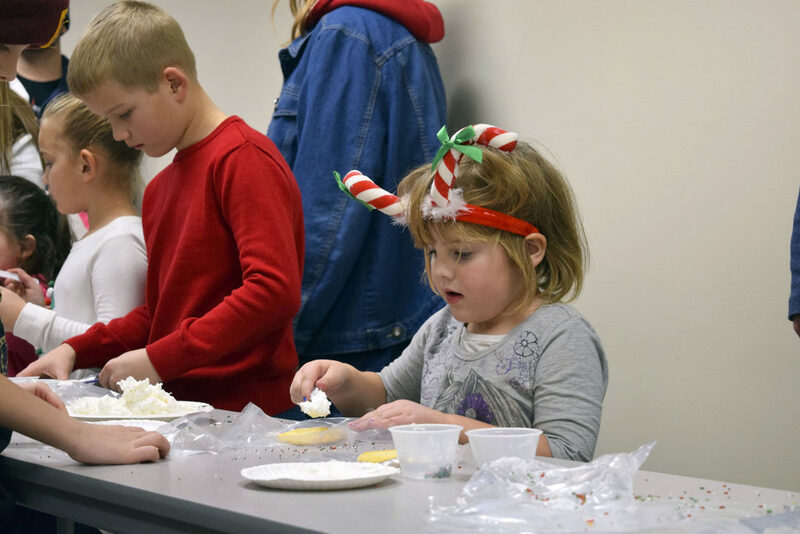 Norah Lane, 5, carefully spreads the frosting on her sugar cookie at the Holiday on Central in 2017. Santa may have been there, but Norah and her sister knew the highlight of the night was cookies. 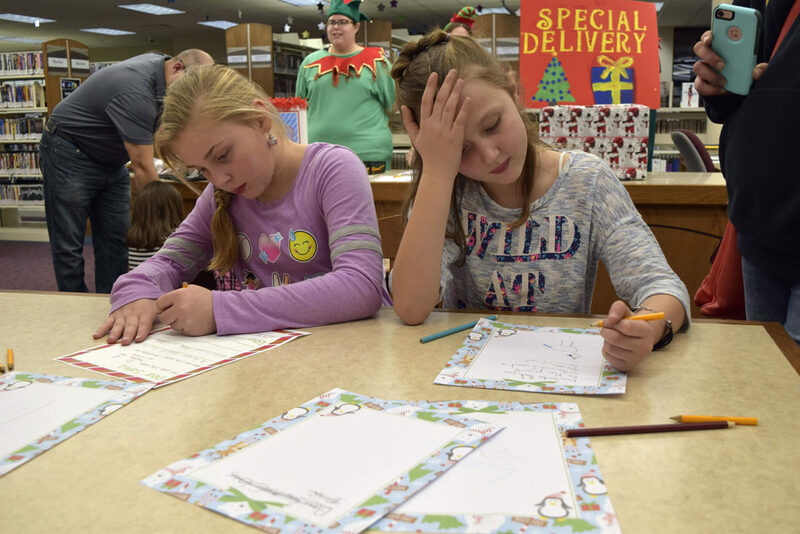 Calliegh Zimmerman, 8, left, and Aleyna Robinson, 8, write their letters to Santa Claus, ready to drop them in the special delivery box. Robinson added a unicorn drawing to hers as well. What did they want? Zimmerman kept hers secret, while Robinson said she just wants to see the real Santa. 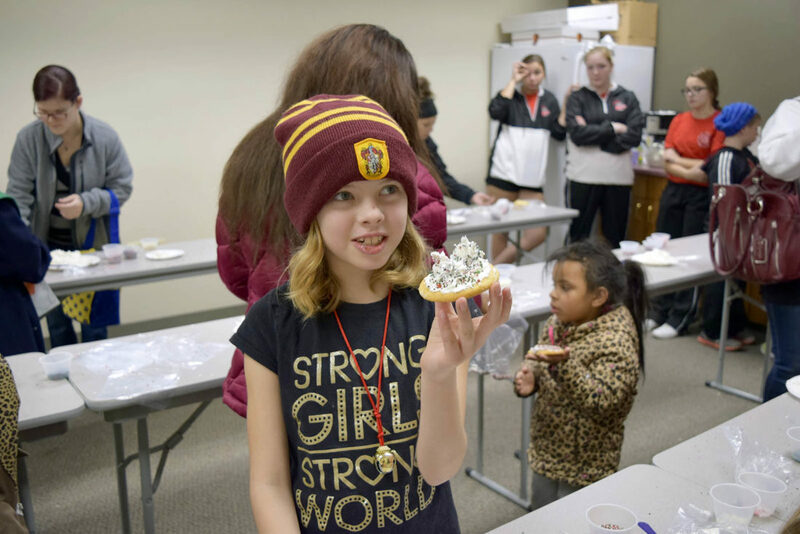 Lyra Lane, 9, shows off her confectionary creation at the cookie decorating station. 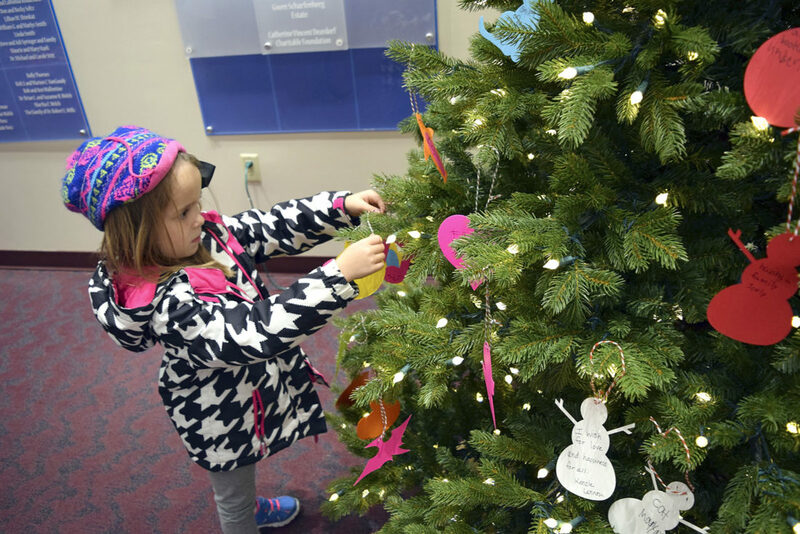 Ava Brockton, 6, of Fort Dodge, hangs her wish on an ornament on the Fort Dodge Public Library’s wishing tree during the Holiday on Central celebration in 2017. The holiday season will be in full swing on Monday when the annual celebration, Holiday on Central, comes to town. The event is hosted by the Greater Fort Dodge Growth Alliance. The festivities will be held at the Fort Dodge Public Library from 5:30 p.m. to 7 p.m.
Jolly Old Saint Nicholas will make his away down Central Avenue and be delivered to City Square Park at 5:30 p.m., courtesy of the Fort Dodge Fire Department. 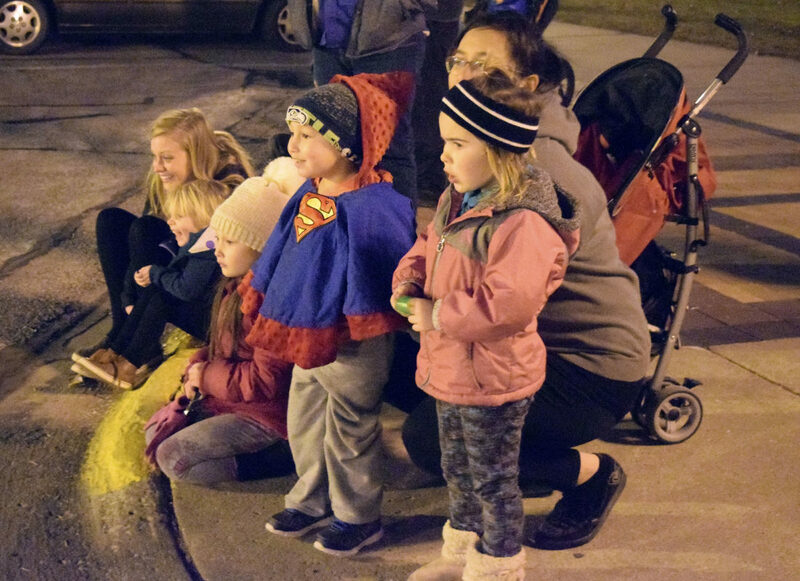 “My favorite part of Holiday on Central is seeing the children’s faces light up when they see Santa coming down Central on the fire truck,” Kate Stucky, Greater Fort Dodge Growth Alliance office manager, said. Santa Claus will be joined by Mayor Matt Bemrich for the holiday lighting ceremony. Following the brief ceremony, families are invited to participate in a variety of kids activities inside the library. 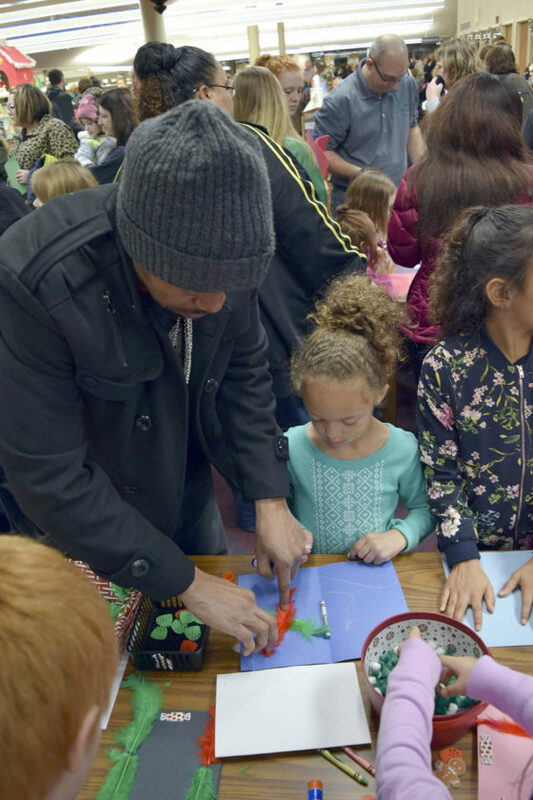 The activities include a holiday craft station, story time, cookie decorating, letters to Santa, hot chocolate and/or apple cider, and local choirs singing Christmas carols. Children will have the opportunity to take their picture with Santa and Mrs. Claus. 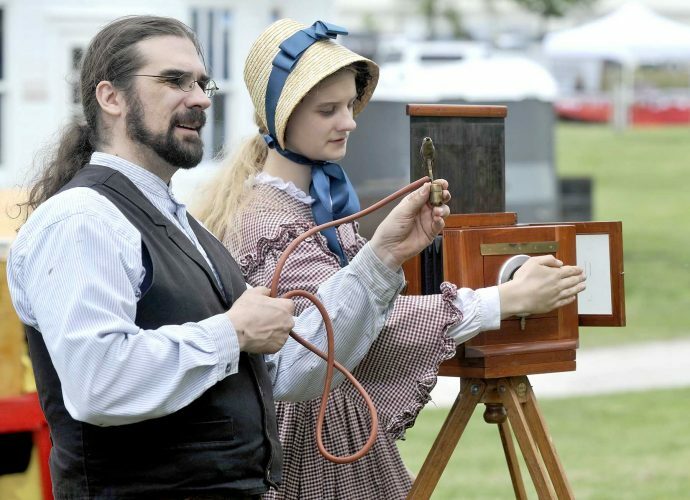 Those who wish to have their picture taken are encouraged to provide their own cameras. Weather permitting there will also be hayrides down Central Avenue and First Avenue South. “We want to provide a positive, family-friendly event that celebrates the holiday spirit and highlights the great opportunities our downtown has to offer,” Stucky said. This free community event is sponsored by the Greater Fort Dodge Growth Alliance, Great Western Bank, City of Fort Dodge, Fort Dodge Fire Department, Fort Dodge Public Library,Hy-Vee, Fort & Schlegel, Candies & More, Kemna Auto, Webster County Conservation, Becker Florist, Olde Boston’s Restaurant and Pub, Fort Dodge Senior High, St. Edmond Catholic Schools, Alpha Media, The Messenger, The Lions Club and AXA Advisors.